Our range of products include franklin lightning arrestor, spike lightning protection system, conventional lightning arresters and lightning protection system. We are the leading manufacturer, supplier and exporter of Franklin Lightning Arrester. These are manufactured from state of the art technology and high grade raw material to meet the national and international standards and offer high and low voltage protection. These are highly popular among our valued customer due to its efficieny to dissiapte heavy current discharges in the ground without any harm to personnel and property. 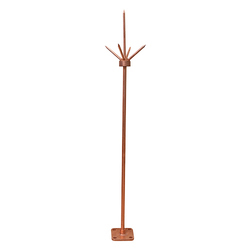 Spike Lightning Arrestor is a metal rod, made of copper and, used as part of lightning safety to protect tall or isolated structures (such as the roof of a building or the mast of a vessel) from lightning damage. With average lightning currents of 20 to 30 kilo amps and heat energy in excess of 20,000°C, the need for improved lightning protection is evident. On the ground of our observations and experiences gained in this field, JMV offers the lightning protection on the structure regardless of the existence of a strike hazard level. 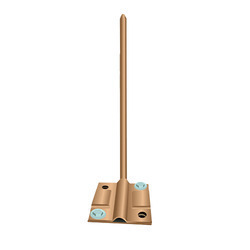 We are a reputed comapny involved in manufacturing and supply of Conventional Lightning Arrestors in india. These are manufactured as per the national and international standards and are in high demand from our buyers. These are available in various sizes to meet the buyers requirement. A Lightning Protection System offers lightning strikes a low resistance path to ground where the enormous energy is then safely dispersed. We contribute in making lightning dissipater which is available as a single rod, 3-spikes and 5-spikes. This metallic lightning arrestor gets mounted on the top of the building and as soon as the lightning strikes, it gets knock down through the down conductors and ground electrodes for the discharge. Looking for Conventional Lightning Protection System ?